The Lunar New Year has arrived already and as an annual custom, I would put up a fairly much-to-do about this occasion, especially given the fact that it is The Year of the Snake, my zodiac year. Such cause for celebration has propelled me to recreate some dishes that reflect my background and the customs that I grew up with during this festivity. In pursuit for some difficult-to-find ingredients for the Nyonya dishes that I’m about to cook this weekend, I had to visit some Indian stores in the heart of immigrant city, Langley Park, MD, in search of fresh curry leaves and dried red chilies. Stepping out of the hallway of a strip mall that exuded a combination whaft of heady incense, exotic dried spices, and fragrant fresh strange herbs, I was about to head to my car when I suddenly recalled that a responder to my blog of a close-by Indian restaurant, Tiffin, recommended another establishment in that plaza that was pure vegetarian. I looked around and walked past it in the rather busy run-down strip mall before stumbling across it on my way back. Woodlands has been around for a number of years, back when I first visited it one night in the early 90’s. I recall that my experience that night was quite memorable but unfortunately I never went back to pay it another visit until this serendipitous encounter, hence the cellphone photos unlike those from the Nikon. Standing at the door, the restaurant had just opened its door for customers, and after a quick perusal of the lunch buffet line, I quickly took a seat in the half empty space. When a buffet line is being served, there is no time for waiting and I went straight to it. The starter was the Rasam Sambar which is a soup consisting of chunks of squash swimming in a light sour broth made spicy with dried chili and fragrant from curry leaves. The buffet line offers two version, one with whole yellow lentils, and the other with pureed lentils that gives it a thicker consistency. I enjoyed the biting spiciness along with the tasty bits of vegetable along with the lentils, which I preferred whole since this version’s broth was lighter for me – this hot sip always sets the right tone for me. 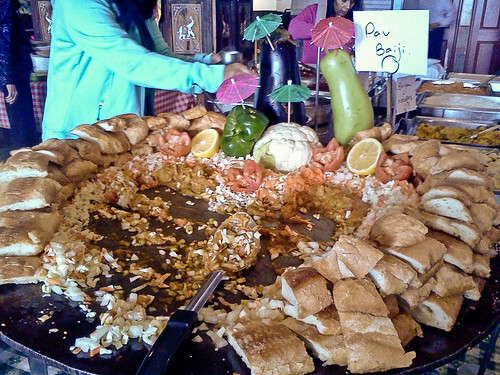 When approaching the buffet line, you are assaulted by a humongous circular flat cast-iron pan serving the dish called Pav Baiji . In the middle of the flatpan is a mound of potato curry surrounded by a ring of bits of raw cabbage and onion, followed by an outer ring of slices of baked bread loaf. I was not sure how to eat this dish since it was very novel to me, but upon research online, it is a typical lunch fare in Mumbai that has been made lighter for the back-breaking worker who has to return to menial labor after lunch. I appreciated the authenticity of this dish and found the combination of the raw bites of vegetable complementary to the mild potato curry. I did not touch the bread since I wanted to make room for the other good stuff. 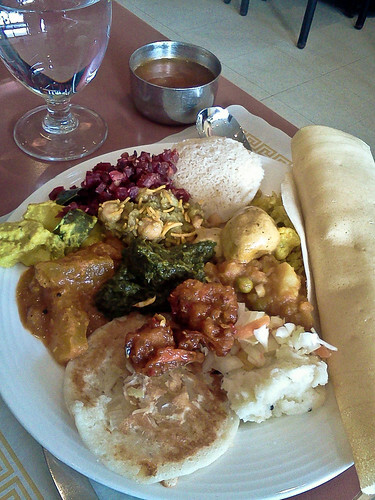 A typical South Indian vegetarian fare is Masala Dosa which is rice flour pancake with a stuffing in the middle. This restaurant’s version is as crispy as in others but it is not overstuffed with a heavy potato mixture. Instead it is rather light with a thin layer in the middle. The customary accompaniment of Coconut chutney made it more irresistible with its nuttiness punctuated with some fragrant curry leaves and spicy dried chilies. There were many highlights from the buffet line. Beetroot Poriyal is a combination of fine cubes of red beets cooked with fragrant cumin seeds that produced a dish devoid of the earthiness associated with this root vegetable. Pala Paneer is a dish combining fresh firm cheese with a spinach puree. What sets it apart from the more known Saag Paneer is that this version is not mixed with mustard green and it is not enriched with cream like the latter. I enjoyed the smooth green puree that did not taste too bitter from the pure spinach and the cheese was mild but rather firm. One dish that I could not get enough of was Avial, which consisted of tendli, which tasted like a chayote squash, “drumstick vegetable”, and potato that is thickened with some yogurt that provided a mild sourness which I enjoyed thoroughly. Chickpeas are prominently featured in Indian vegetarian cuisine and one version offered here is Chana Chaat. It is a melange of chickpeas and mashed potato seasoned with tamarind sauce, cilantro sauce, and tomato ketchup, elevating this dish beyond pure starch. The bits of puffed vermicelli on top provided the necessary crispy texture to the mushy consistency. It was one of my favorite dishes. The first serving was not enough since another plateful revealed more wonders. 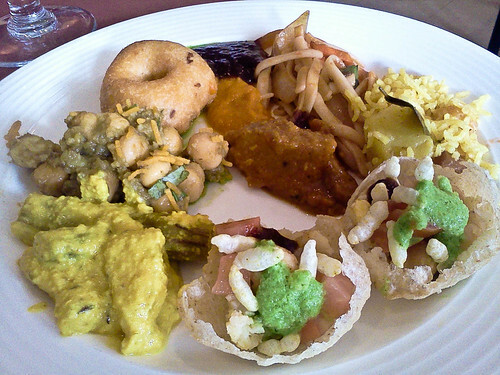 Another common Indian appetizer was the first bite from this plate – Medu Wada. These small savory lentil doughnuts were lighter than the ones I have savored, packed with some spice fragrance and a slight sourness that was complimented by the typical sauces. The tamarind sauce was thick and dark, an indication of it being house-made with its sourness well tamed, and the cilantro sauce was flourescent creamy green replete with its herbaciousness – here we see the restaurant paying close details to the background players. A couple of bites of the Fried Noodles dispelled any doubts of the dish’s appearance and I quite enjoyed the sweet and sour tomato-based sauce coating the delicate strands of noodles. The Veggie Biryani was a heady rice dish spiked with whole pieces of cinnamon, cloves, and whole curry leaves. The bits of pumpkin added the sweet element to this savory dish along with bits of rich cashew nut, which added a bit of unctousness to the mouthful. Veggie Manchu are bits of whole vegetables that have been battered and deep-fried and lightly coated with a slightly sweet dark sauce, paying homage to its meat version, General Tso Chicken, which left me sated as if having eaten its original meat version. A couple of servings of Chana Bandar sealed the deal for me about this restaurant’s authenticity and quality cooking. Puffed dough shells are available for the customer to be stuffed with cooked chickpeas, further topped with fresh tomato and onion, puffed rice crispy, and moistened by a gravy or the tamarind or cilantro sauces. I had only seen this dish on travel and culinary channels, and I was excited to finally savor this multi-flavored and textured dish – Yumm! Despite the level of satedness I was feeling, I could not resist having a few bites of dessert. The first offering was Vermicelli Kheer made with strands of fine vermicelli and tapioca pearls swimming in a pool of sweetened cooked milk. I enjoyed a few spoonfuls of it before deciding that it was a bit too sweet for me. 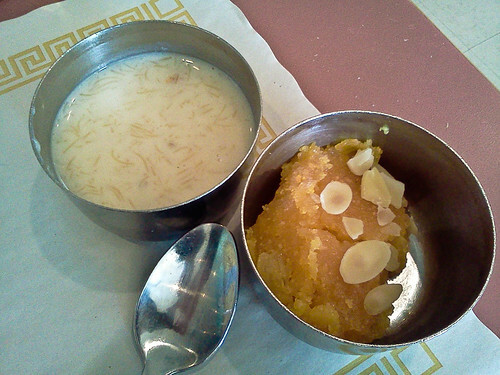 Just when I thought I was eating some Halwa, a sweet carrot puree, it turned out to be Rava Kesari, a thick sweet cream of wheat orange mixture, filled with surprising chunks of sweet pineapple and almond slivers that made it difficult to put the spoon down. Note to the diner – leave some room for these sweet dishes. 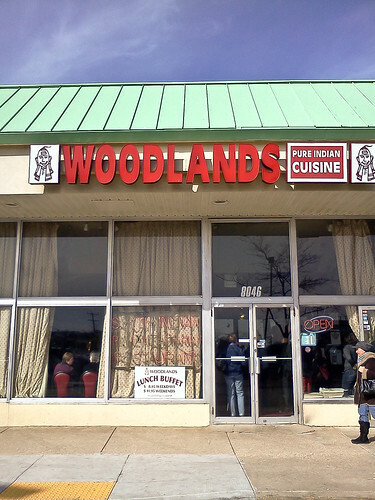 I walked out of Woodlands feeling both gastronomically satisfied and pleased that I had a chance encounter with this wonderful establishment, especially one serving authentic Southern Indian vegetarian fare. An hour after my entrance, I passed by a long line of customers waiting for a table for Sunday lunch, hungrily anticipating the delicious offerings on the buffet line. I walked past them noting to myself, “Why have I not been back all these years?” Now I know what I have been missing all these years. Neither should you. It sure was, not being boring or bland.